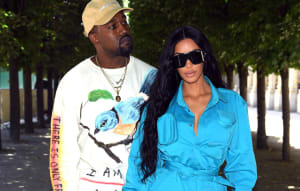 Last week, in the middle of a series of Tweets about the failures of the Grammys, Kanye West also announced plans to release a new album this summer. This weekend, he named the project, writing on Twitter, "my next album is titled 'Turbo Grafx 16' as of now." "On some super nerd vibes," he added. "One of my favorite gaming systems when I was a kid." The Life Of Pablo can only be streamed on TIDAL for now, but apparently Kanye is already working on the follow-up. A photo surfaced on Instagram today from Kanye's longtime confidant Ibn Jasper showing the rapper and several collaborators crouched over laptops on a cluttered table. The caption reads "TURBO GRAFX 16 day 1 #PABLo #MikeDean #CUDi #PlainPat." Kanye recently shared another unreleased track that is supposedly called "Saint Pablo." Check that out here.